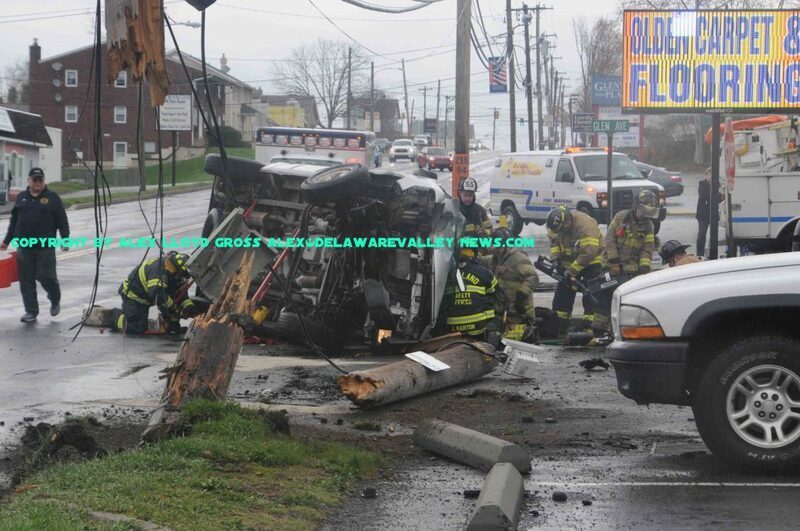 Alex Lloyd Gross Photo- Delaware Valley News.com Rescue workers cut open the van. One man is seriously injured after the van he was driving slammed into a utility pole on the 400 block of E. Lincoln Highway in Penndel. The pole snapped, causing wires to dangle from them, precariously just a few feet over the heads of rescue workers who worked feverishly to free him. The accident location is just north of Neshaminy Street, by the bowling alley. The force of the impact caused the van to flip onto it’s side, trapping the driver. Fire crews from Penndel, Trevose and Parkland went in service with chains and hydraulic tools, to pull the dash away from the mans feet. He sustained serious injuries from the crash. Northbound Rt 1 will be closed for an extended period of time and that may include periodic closing of the southbound lanes as well. The crash happened about 2:30PM. The drivers name was not released by police.